I was reminded recently of how important time alone is for our spiritual health. Working, managing a household and raising three young boys leaves very little free time in my day. However, I intentionally carve time out to be alone, even if just for a handful of minutes. Sometimes I steal a moment in the middle of the night, waking up to get a drink and staying up for 30 minutes or so while the house is asleep and silent. Other times, I wake up just a little bit earlier to get that time alone in peace. I’ve also taken time during my work day to run errands, and instead of rushing back I take 10 minutes to be alone before returning inside to finish my day. Yes, I’ve had to get creative. No, I’m not always able to do it every single day. Some days it it is just too difficult and I cannot do it, but it is something I understand has great significance and value in my spiritual life… and I believe in yours as well! The time spent in solitude is precious. It is there that I connect with the Divine. Often it is at the conclusion of these times that I do my best writing. After clearing my mind, breathing and opening myself up, the words often flow effortlessly to the screen. In this way I am affirmed that something truly special is occurring when I take the time to be alone and away from the hustle and bustle of my daily life. Even Jesus took time away to be alone and to be present with God. I believe in these moments we can be recharged, reconnected and refreshed spiritually. 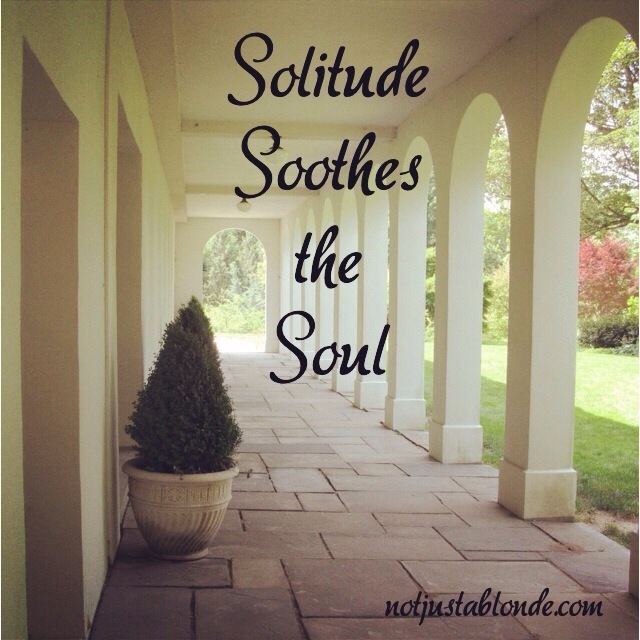 Solitude is a gift to the soul. Make it a priority in your life and you can experience this beautiful gift as well. I admire your intentionality! I treasure my sloitude as well, and I rejoice that I am at this juncture in my life which allows me all the solitude I need and want. You remind me to be a good steward of this gift. Thank you. ❤️… and thank you for commenting and for the compliment as well! Yes, being alone with God is when we have a real opportunity to savor His Presence and hear what He has to impart to us. Its value cannot be over-rated. This is vital and I agree with Rita – your being intentional to steel away with the Lover of your soul is precious. Reminds me of young love that grabs any free time to be together.